I have been continuing to experiment with “automating” some version of the staggered leaf, and have reached a “final” punchcard version. 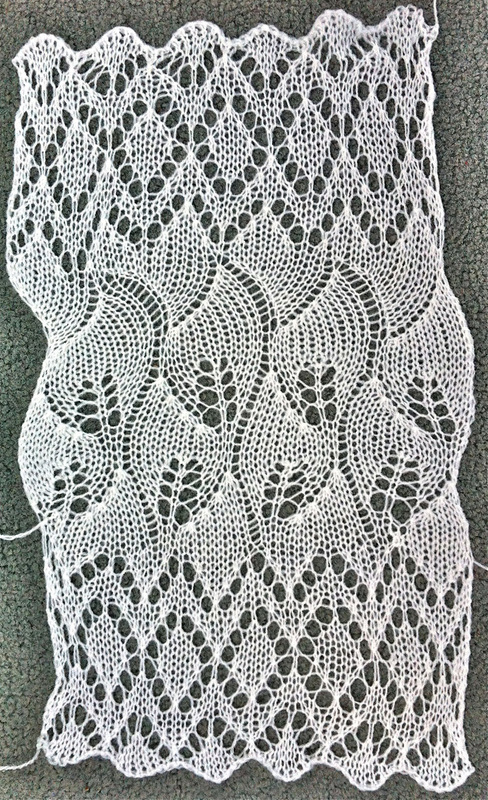 Wanting to add a border top and bottom and getting the 2 ends to “match” without a center pivot point led to the resulting fabric below (swatch is not properly blocked). 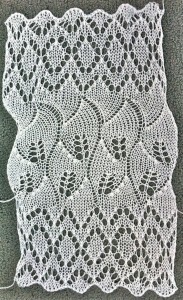 The punchcard for the leaf pattern is over a 100 rows in length. I actually had never purchase anything on ebay. The length of the card repeats I want to play with led to my looking for punchcard rolls. “Back in the day” the ones available were clear, and not numbered or marked in any way, a relative “pain” to use. Through an online search I found this item and purchased it. The order was filled very quickly. The roll is of sturdy stock, with Studio numbering so a bit of added markings are required for use on Brother KMs. I live in an area with no local suppliers for this sort of thing, buying directly from overseas was an option I had not considered before, and proved to be a positive experience for me.